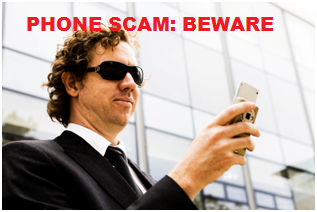 February 3, 2014 (San Diego)--Residents of San Diego County are being asked to report any calls they receive from someone claiming to be a peace officer and subsequently asking for cash payment, the Sheriff’s Department announced this week. According to the department, several residents have reported suspicious phone calls by a man who says he’s a member of the Sheriff’s Department, then states that the person answering the phone — or a member of the family — has an outstanding warrant for their arrest. He then asks for cash payment in order to avoid arrest. Sheriff Bill Gore is reminding residents that the Sheriff’s Department will never call anyone seeking payment for outstanding arrest warrants. If you’ve received a call similar to the one described above, authorities are asking you to report it to the Sheriff’s Department or your local police agency. Think you may have information on this case? You can leave an anonymous tip by calling the Sheriff’s Department at 858-565-5200 or Crime Stoppers at 888-580-8477 and be eligible for a $1,000 reward for information leading to an arrest.